We took a family field trip last weekend to the wilds of Walthamstow, to see some great friends and to have a brief poke around the International Supermarket, one of my favourite food shops anywhere. Really, I'll take a well-stocked supermarket catering to a community with a vibrant food culture any day over a posh deli. Fresh and lovely produce, intriguing grains stacked ceiling high and fragrant breads and baklava. I couldn't spend as long as I would have liked (pesky family! pesky dinner reservation!) 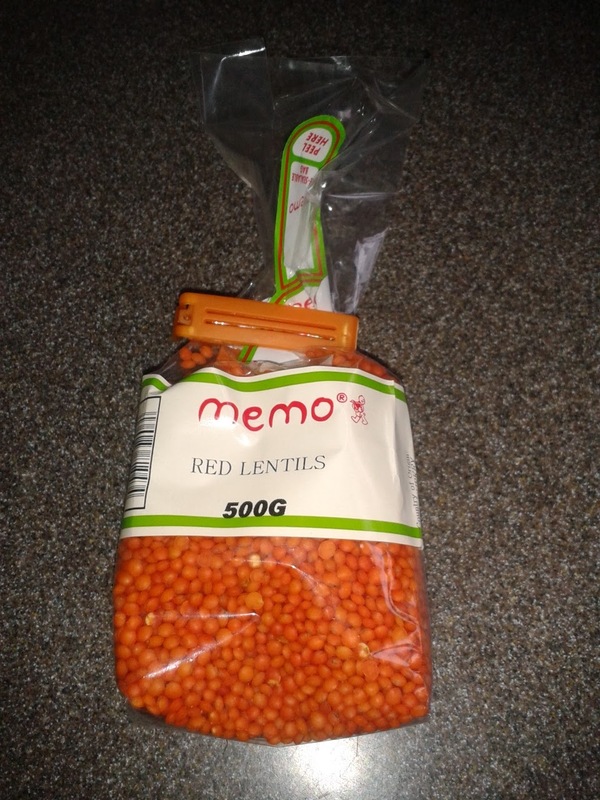 but I grabbed a bag of these lovely lentils. Look at them! They're gorgeous! The recipe on the box was brief and took a relaxed approach to English grammar (yeah, since you're asking, my Turkish is just impeccable, thanks) but I adapted it to create the version that I offer to you now. Really, really do try it. It's one of those incredibly simple recipes (what are there? six ingredients? seven?) that really manages to be way more than the sum of its parts. You could make a batch of this - as I did - and have amazingly satisfying lunches available to you for a week, for roughly tuppence ha'penny. Melt the butter in a large saucepan and sauté the onion until it's translucent. Add the lentils and stir, then add the tomatoes, bulgur, mint, stock cube and enough water to cover the lentil/onion mixture and then perhaps another 500ml on top. Simmer over a low heat until the lentils and bulgur are tender - 20 minutes or so should do it. When it's cooked, purée using a stick blender, check the seasoning and thin down as necessary - I like my soups quite thick. If you like you could drizzle it with olive oil and scatter a bit more of the dried mint to serve. Sorry the pictures are so rubbish. Certainly haven't spent the last year and a half improving my photography skills. Cleanup rating: One pan, one spoon. Geddin. Can I freeze it? Why not? Great to have soup on standby in the freezer. Just make sure you label it. There are more repurposed ice-cream containers in the bottom drawer of my freezer containing who knows what than I care to mention... I'm slightly scared to go in there.